FILE - The American flag is flown next to the Chinese national emblem during a welcome ceremony for visiting U.S. President Donald Trump outside the Great Hall of the People in Beijing, Nov. 9, 2017. To hear President Donald Trump tell it, he was made for a moment like this: A high-stakes face-off. A ticking clock. A cagey adversary. "I'm very prepared. You know, it's not like, 'Oh, gee, I'm going to sit down and study.' I know every stat. I know it better than anybody knows it. And my gut has always been right." Beijing disputes those allegations and asserts that Trump's sanctions are merely an effort to hinder an ambitious rival. 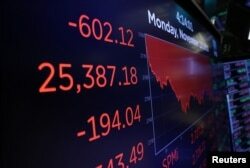 The Dow Jones Industrial Average is shown on a monitor at the close of trading on the floor at the New York Stock Exchange (NYSE) in New York City, Nov. 12, 2018. FILE - U.S. President Donald Trump and Chinese President Xi Jinping participate in a welcome ceremony at the Great Hall of the People in Beijing, China, Nov. 9, 2017. 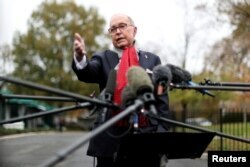 FILE - White House chief economic adviser Larry Kudlow speaks to reporters outside the White House in Washington, Nov. 13, 2018. "They were not authorized by anybody," Kudlow said. "I actually think he did the president a great disservice." 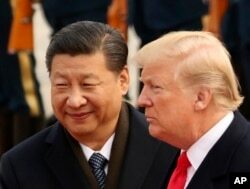 Regardless of which approach Trump takes to Buenos Aires, Trump and Xi don't have to resolve their differences this week. A cease-fire that suspends any further escalation of the U.S. tariffs wouldn't be unprecedented. The administration and the European Union, for instance, reached a truce last summer that suspended threatened U.S. tariffs on European auto imports. "No one is expecting they will come out with a solid agreement," said Quincy Krosby, chief market strategist at Prudential Financial. "What the market wants — what the market needs — is a sense that they are negotiating and that the negotiations will continue."